Most people today own a dishwasher. Even the Atlanta home inspector has a dishwasher that has to be cleaned and maintained. A few years back someone suggested that the orange drink mix Tang would help to clean out your dishwasher. Although the Atlanta home inspector has not tried this method, others have, and boast that it does work. If you cannot purchase Tang or would rather use a different method, check out the suggestion below! You’ll want to periodically scrub and disinfect your dishwasher so that it remains clean and healthy, and so that your dishes stay that way, too. Curb the breeding ground for mold and mildew growth spurred on by food particles and soap scum. Remove all racks from the dishwasher. Wash with dish-washing detergent and set aside to dry. Mix 1 part vinegar with 4 parts very hot water into a spray bottle. Spray the mixture on the dishwasher seal and anywhere else you see discoloration, mold or mildew. Scrub the affected areas with a non-abrasive scrub brush. Replace racks in the dishwasher. Fill a small, dishwasher-safe bowl with white vinegar and place on the top rack. Without soap, run the dishwasher at the highest temperature setting available. Then, after performing these steps, you find that your dishwasher still has an “odor”, or if mold or mildew remnants remain, immediately pour 1 cup of baking soda on the floor of your dishwasher, and run the cycle a second time at the highest temperature setting available. If your mold/mildew problem persists, you should check the dishwasher’s drain line. If it’s kinked, water may be unable to drain and will pool at the bottom of your dishwasher — a mold-breeding situation. You should also check the food trap at the base of the dishwasher for too-large-to-drain pieces of food. 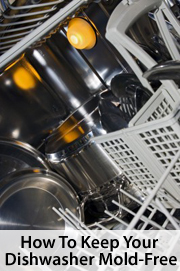 A good dishwasher will last years with proper care and maintenance. Keep yours mold- and mildew-free. As a home inspector in Atlanta GA, we see all kinds of things in the homes we inspect…. some places make us think twice about eating after we leave there. So when we ran across the following article, we thought we would share it as a great way to keep your own home a little less germy! 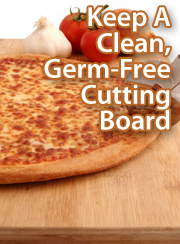 Germ studies show that a kitchen cutting board carries up to 200 times more bacteria than a toilet seat. This is because homeowners clean their bathrooms with fervor, while only “rinsing” down parts of their kitchens. In failing to disinfect cutting boards (among other kitchen mainstays), homeowners in Atlanta and everywhere else leave untouched a prime bacteria breeding ground, and may be getting sick as a result. According to the CDC, 48 million Americans get sick from food-borne bacteria each year. If it’s been a while since you’ve cleaned your kitchen cutting board, here are some tips on how to do it properly. Homeowners with plastic cutting boards will have an easier go that homeowners with wooden cutting boards. If your cutting board is plastic, just place it in the dishwasher with dishwasher detergent. If your dishwasher has a “sanitize” feature, be sure to select it. Prepare a solution of natural dish soap and hot water. Without submerging the cutting board, scrub it with the solution. Towel dry the board and allow it to air-dry until completely dry. Apply a thin layer of undistilled white vinegar to the board surface either by spray can or paper towel. Allow the vinegar to sit for 30 minutes, then wipe clean. For preventative care, you should also consider using separate cutting boards for meats and for fruits and vegetables. This can prevent cross-contamination. In addition, purchase a food-grade mineral oil and apply it to your wooden cutting boards regularly. The kitchen is among the “germiest” places in your home. With extra attention, though, you can help keep it as bacteria-free as possible.